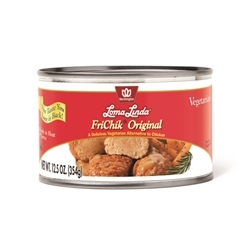 Loma Linda® FriChik is a delicious vegetarian alternative to chicken nuggets. 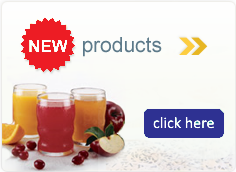 Ingredients: textured vegetable protein (soy protein isolate, soy protein concentrate, wheat gluten, water for hydration), water, soybean oil, egg whites, corn oil, contains 2% or less of salt, dextrose, corn starch, potassium chloride, disodium inosinate, phosphoric acid, hydrolized soy protein, modified corn starch, guar gum, baking powder, (corn starch, sodium aluminum phosphate, sodium bicarbonate, monocalcium phosphate), onion powder, carrageenan, vitamins and minerals (niacinamide, iron [ferrous sulfate], vitamin B1 [thiamin mononitrate], vitamin B6 [pyridoxine hydrochloride], vitamin B2 [riboflavin], vitmain B12 [cyanocobalamin]), natural flavors from non-meat sources, wheat fiber, nonfat dry milk. Broth: water, modified corn starch, hydrolyzed wheat gluten, corn gluten, soy protein, salt, phophoric acid. Contains: wheat, soy, milk and egg.